The Vitra MedaPal office chair is the first office chair ever to be awarded the Blue Angel, and so certified to reaching contemporary environmental standards for furnishings. Furthermore, the design by Alberto Meda contains all the functions necessary for a comfortable, supportive, working experience. Care For cleaning the plastic surfaces always use a soft, damp cloth and a mild detergent. Dust and fluff can be simply vaccuumed. For removing small soils use a soft, damp cloth and a mild detergent. What is the difference between the Nova and Torso Meda covers? Nova is a 100% woven polyester textile. Torso Meda is knitted from a combination of 95% polyester and 5% elastane. Knitted fabrics are more elastic and so allow for the covering of more complex areas. In the case of the MedaPal with Nova covers, a seam can be seen on the front of the cushion. The MedaPal with Torso Meda covers does not have this seam. From optical, quality and durability perspectives both materials are of an equally reliable high standard. Customers in Germany can request fabric samples ahead of a purchase. 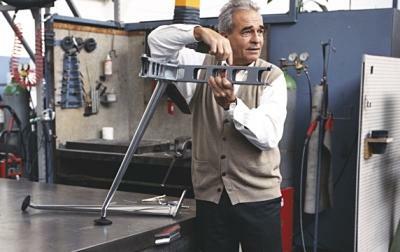 How much weight can a Vitra Medapal support? The MedaPal is tested up to a weight of 110 kg. When used by heavier individuals the process of wear and tear on the MedPal joints and connections accelerates. 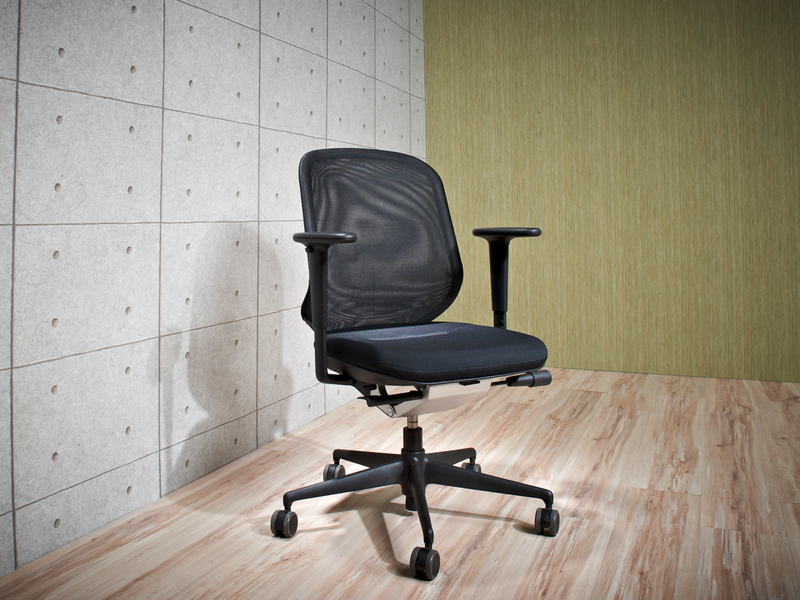 Aside from the weight of the user, wear and tear is also influenced by how the chair is used. When, for example, you regularly drop heavily into the chair or place undue weight on the armrests while getting up from the chair this can have a greater impact on the stability of the chair than the weight of one, more careful if heavier, user. 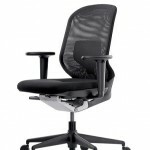 What is the lumbar support? 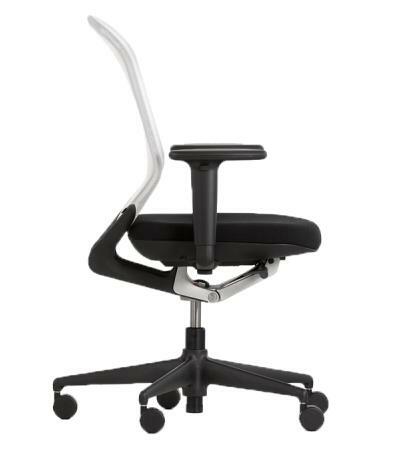 Through the curved form of the lower half of the backrest the MedaPal is exceptionally ergonomic; however, the optional height adjustable lumbar support allows for individual support. 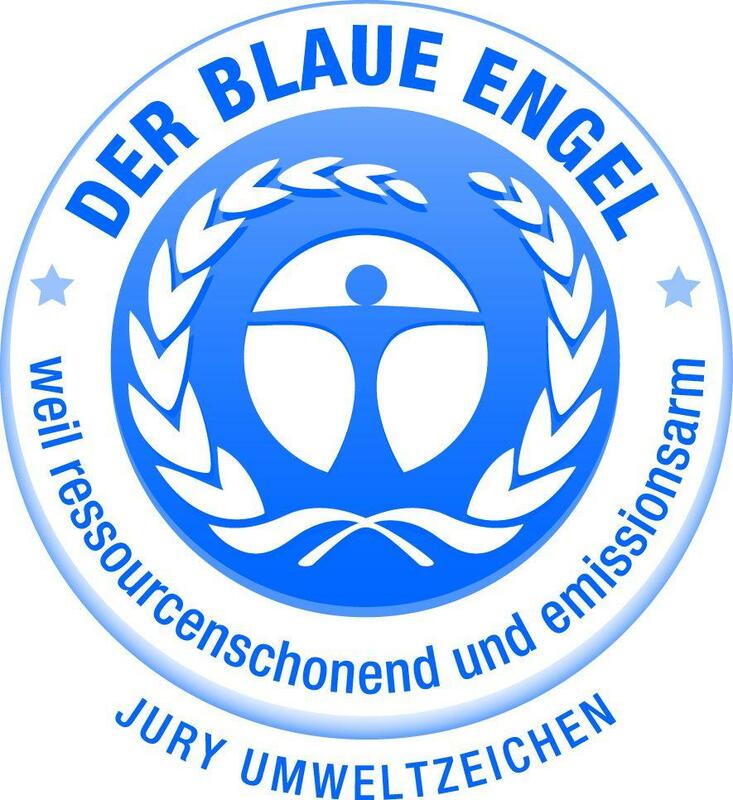 The MedaPal is and was the first ever office swivel chair to be awarded the Blauen Engel - a recognized German certification for products and services that meet specific environmental standards. Created in 2005 by Italian designer Alberto Meda for Vitra, the MedaPal was awarded the Blauen Engel in 2009 in the category "low emission upholstered furniture": which means that all materials employed have been tested for formaldehyde, solvents and plasticisers and have been found to be within safe limits. In addition the MedaPal has been awarded the Greenguard Indoor Air Quality Certificate. The Vitra MedaPal is however not just environmentally responsible, but also helps support a healthy work life. In addition to possessing a synchronising mechanism which allows for individual setting of the backrest tension, optional lumbar support and a height adjustable seat as standard, the MedaPal is also EN 1335 certified for its ergonomics. 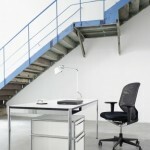 Consequently the MedaPal offers a chair that supports you and your environment in a neat, visually endearing, package. The MedaPal office swivel chair by Alberto Meda for Vitra is produced in Weil am Rhein, Baden-Württemberg. In terms of the production process Vitra place a particular emphasis on sustainability: a focus which also helped the MedaPal achieve its Blauen Engel certification. In addition to being composed of some 33% recycled material the MedaPal is is 94% recyclable. Seat shell, arm rest supports, frame and base of the MedaPal are crafted from fibreglass reinforced polyamide while the cushions are formed from CFC free polyurethane foam. Whereas the seat can be upholstered in either Nova or Torso Meda fabric, the backrest comes as standard in Netline (a netweave fabric). All Vitra MedaPal's come with a ten year guarantee. The Vitra MedaPal was designed by Alberto Meda. Born 1945 in Tremezzina, Italy, Alberto Meda was initially employed in the research laboratories at Kartell before establishing his own design studio. For Vitra Alberto Meda has created, in addition to the MedaPal, the Meda Chair, Meda Slim and Meda Conference. 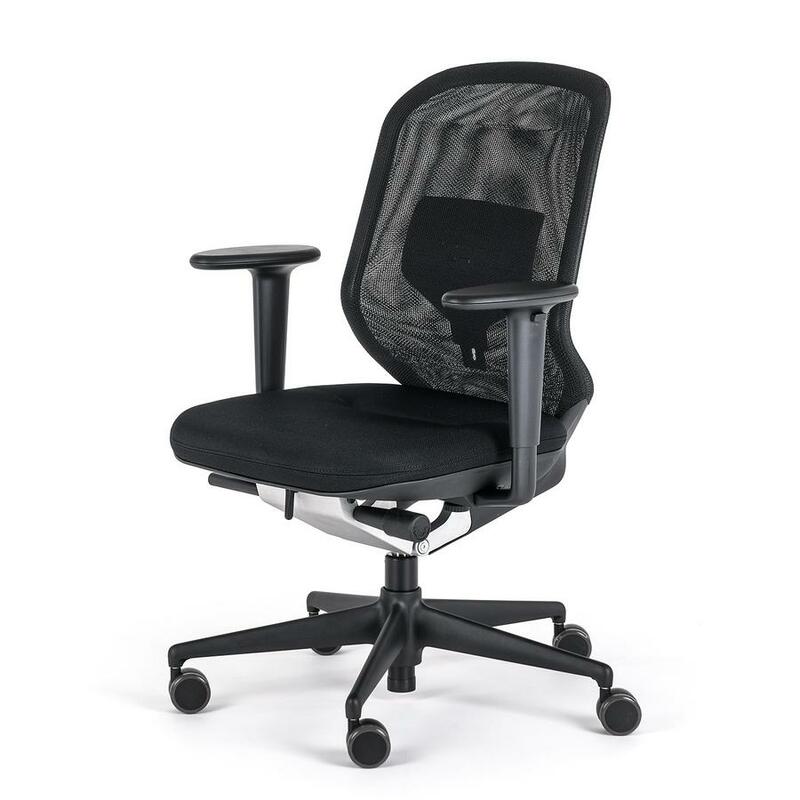 His most recent contribution to the story of ergonomic office seating is the chair Physix. 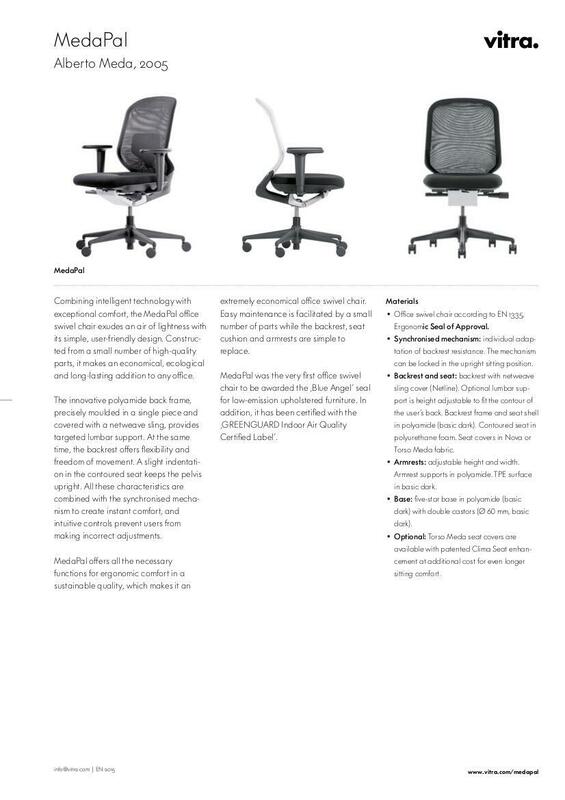 Launched in 2013 Physix presents the latest standards in and understanding of active ergonomic seating in a product that is visually very reminiscent of the Charles and Ray Eames famous Aluminium Chair collection. The subjects of numerous exhibitions and recipient of numerous design awards, Alberto Meda lives in Milan and since 2003 has held a teaching post at Venice University. 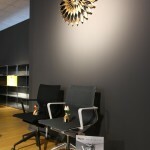 The MedaPal is manufactured by the Basel based contemporary furniture company Vitra. On a trip to America in 1953 Vitra founders Willi and Erika Fehlbaum spotted furniture designed by Charles and Ray Eames and decided to seek permission to produce the works themselves for the European market. A wish which was granted in 1957. Subsequently Vitra cooperated with Verner Panton on the development of his classic Panton Chair before entering the office furniture market in the 1970s. 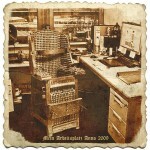 A period when the industry understood ergonomics. But not design. Something Vitra changed in 1976 when they presented the Vitramat by Wolfgang Deisig at the very first Orgatec trade fair in Cologne. 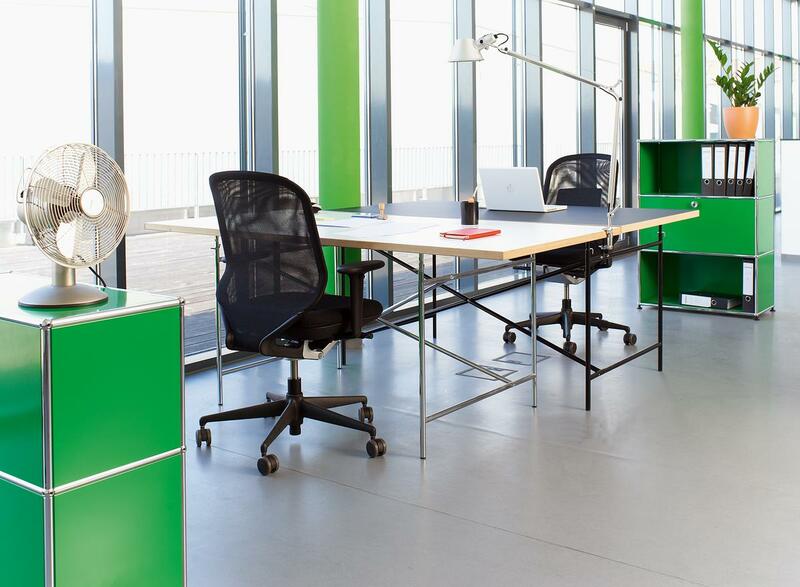 Since then Vitra's commitment to high quality design with a well considered aesthetic has helped them become a market leader in the global office furniture industry. As perfectly demonstrated by the MedaPal.